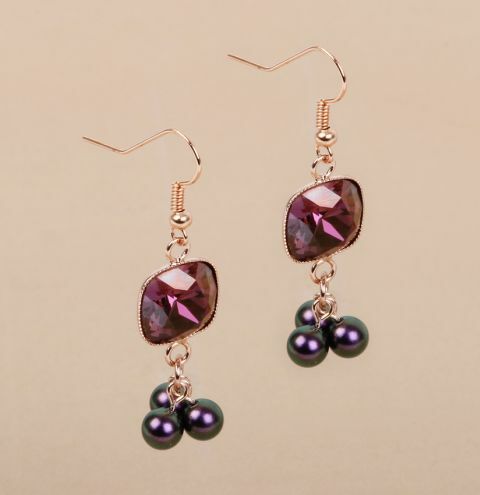 Make a delicate pair of earrings Swarovski in rich autumn tones with Swarovski crystal pearls from the Summer Clearance. Take three eyepins and trim the end leaving 3mm below the loop. Apply a small drop of Fevi Kwik glue to each and and glue them inside the half drilled pearls. Connect each pearl to a jumpring and link it to one of the loops of the connector. Carefully open the loop of the ear wire and close it onto the top loop of the connector. Apply a small drop of glue to the connector and set your crystal in place. Allow to dry before wearing your earrrings.